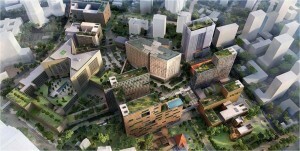 Step into the all-inclusive medical hub and vibrant ambience in Royal Square Novena. Comprising a fantastic hotel, restaurants, shops and medical suites, Royal Star entices everyone with its all-in-one efficiency that permits guests and medical tourists to rest conveniently at the 4-star classy hotel located above, and get their daily requirements at the mall located below. Built uniquely by the thoughtfulness of innovative combinations, this is the ideal choice for investors and medical professionals. Besides the existing medical hubs, healthcare professionals can benefit easily from seamless coordination with technologies, clinical experts and facilities nearby. The congregation of medical experts will lead to a regionally reputed medical brand in the area. The place is set to draw business travellers medical tourists and visitors from across the region. With a growing population of affluent residents in proximity, backed by surrounding hotels, schools, medical facilities and offices, Royal Square Novena with an area of 6,676.8m2 will become an astute address. Royal Square Novena is a new retail and medical mall based at the intersection of Irrawaddy/Thomson Road in district Dll in Singapore. There will be a total of 772 units, which will basically house restaurants, shops, hotel units, and medical suites-all of which are in the process of development. It will be used for mall shop rental and sale. The property is 0.1 kilometer away from NS20 Novena MRT Station. Royal Square Novena is located at one of the most prestigious estates in Singapore. It’s adjacent to Novena MRT Station and next to the upcoming Health City Novena, which is the largest health complex in Singapore scheduled to be completed by 2030.